In contrast to the clarity of last weekend's race to number one, this weekend sees at least two new films with eyes on the mark. The Road to Perdition and Reign of Fire will duel the incumbent Men in Black II for box-office supremacy and I would not be surprised to see the gap between the three be as small as $5 million in the final analysis. Rounding out the slate of notables are a new outing of the Halloween saga and The Crocodile Hunter, making this the third straight weekend with a straight-from-cable film. Is the world ready for Tom Hanks, hit man-with-a-heart-of-gold? No one can be squeaky clean all the time; even Jimmy Stewart played a couple of villains. More recently, Mel Gibson made the dark Payback work and John Travolta seems to be trying to make a career out of playing the heavy. Of course, it's entirely possible to overstate this case; it's not as if Hanks is playing Hannibal Lecter here. His role in The Road to Perdition actually seems more similar to the Death Row warden he played in The Green Mile than something from a Tarantino film, as some breathless descriptions ("Hanks goes dark!") would have you think. Adapted from a graphic novel, Perdition boasts not only Hanks but also Oscar winner Paul Newman and Oscar nominee Jude Law in key role as well as Sam Mendes, Best Director winner for American Beauty. With this pedigree and a Depression era crime storyline, this film virtually screams "Oscar hopeful"; however much it wants that label, though, it needs to perform at the box office to get a real chance. In what appears to be an exercise in pattern recognition, DreamWorks is launching the film at an undersized 1,797 venues. This matches a strategy employed by another mid-July-released Tom Hanks film with an odd title, Forrest Gump. Perhaps you've heard of it. Starting in just 1,595 venues, it powered its way to $24 million in July of 1994 and then all the way to $300 million+ and a Best Picture Oscar. While that's not the only film to use a mid-sized start to propel itself to box-office glory, it does seem to prohibit it from doing as much as it can its first weekend. As popular as Tom Hanks is, he's had a few films that took time to pick up steam. The film I cited as the closest analog above, The Green Mile, garnered a modest $18 million in December of 1999. You've Got Mail started with just $18.4 million, taking after the film it was a de facto sequel to, Sleepless in Seattle, which made $17.3 million on its first weekend in June of 1993. All of these figures come up when ticket inflation is applied, but not past $22.5 million. None of these films suffered in the long run, and I'm sure that the continuation of this trend is what DreamWorks is counting on. There's also the fact of there being not much sizzle to sell here; good acting may just be the toughest thing to sell about a movie. This smaller start may be a wise move if it can distinguish itself from everything else out there in the summer marketplace. There's certainly nothing else like it out there right now. The studio should be hoping for about a $19 million weekend to propel it through the summer. Thus the unusual case of the highest-profit release of the week likely not being the highest-grossing new release. 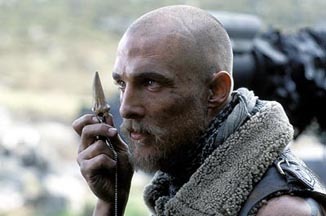 That honor belongs to Reign of Fire, the most precariously-positioned film of the week. With its apocalyptic tale of dragons-versus-armies, it seems on paper like nothing more than this year's Battlefield Earth. However, this just looks more fun and somehow less ridiculous. Comparing it with films people actually wanted to see, it looks similar to 1995's Species, which took in $17 million opening weekend with just as killer a concept and a no-name cast. Matthew McConaughey and Christian Bale are just slightly above that status, but neither bring much in the way of star-power to the equation. The draw, then? It's the dragons, silly, which in this picture have arisen and taken over most of the world, leaving humanity cornered into small pockets of resistance. There's very few dragon-related pictures to use are comparison films, although 1996's Dragonheart springs immediately to mind. Expanding the scope somewhat, Reign of Fire also owes some of its existence to Jurassic Park, though it has neither a pre-built paperback-reading audience nor flashy Spielbergian style. Handling the reins here is Rob Bowman, formerly of The X-Files, both TV and theatrical versions. He's proven himself capable of making the ludicrous seem plausible, a skill that will come in handy here. By virtue of its 2,629 venues, it has the inside track on the rest of the releases this weekend and may translate that into an opening weekend of about $23 million. It's upstaged on yet another front, though, as it's not even the strangest new release of the week; The Crocodile Hunter: Collision Course may take that mark, not only for the week but the year. With every cable channel scrambling to package their flagship programs into the big screen format (Coming soon, The Food Network Presents Iron Chef: Chairman Kaga's Revenge), The Discovery Channel seems to have served up the most bizarre concept they could think of (or "conceived in a delirium by a madman", as one review would have it). An intelligence satellite crashes into the Australian Outback where it's eaten by a crocodile. The CIA agents chasing it then run afoul of Steve Irwin, Crocodile Hunter, along with his wife and dog. Not only is this the most bizarre premise since The Gods Must be Crazy, Steve Irwin's parts of the film are shot exactly like his TV show, in regular TV screen aspect ratio. It's enough to make you wonder whether they actually told him they were making a movie with him. Smartly being pushed as a family film, it should be able to capitalize on the near-universal recognition of Irwin, the Jackie Chan of wilderness adventures. This ought to be good enough for about $9 million this weekend. In the "why bother?" category, we have the latest installment of the Halloween series. While 1998's Halloween: H20 had the novelty of bringing back Jamie Lee Curtis, going to that well the second time like they do here just doesn't have the same effect. Aware of this, the producers decided to go with a Big Brother/Blair Witch theme...just two years too late, unfortunately. I must give the advertising credit though, as I'll admit to nearly choking on my Junior Caramels when the horribly trite-looking trailer suddenly shifted to the famous Michael Myers theme. Bravo, folks; bravo. It's likely not enough, as this year's Jason X showed, which made only $6.6 million on opening weekend with a more off-the-wall premise. The Halloween series has, for some reason, always attracted a slightly higher brand of actor to be brutally slaughtered; in addition to Curtis, Busta Rhymes, Tyra Banks and Thomas Ian Nichols of American Pie fame appear. It's not going to be enough to match the $16 million of the last entry, and about $8 million is a good expectation here. Men in Black II set records last weekend for the July 4th weekend, but just barely, leaving questions about how much steam is left in this franchise. After five years of ticket increases, one would expect a sequel to one of the biggest films of 1997 to do more than squeak past its predecessor's mark. Also troubling is the B+ CinemaScore mark, which, coming from a scale that generally rivals Hooray for Everything for positiveness, shows unexpected weakness. Add this to the trend of films only holding audiences for one weekend and it spells trouble for its extended run. I foresee a drop as large as 50% with the possibility of more; a $26 million total for this weekend would place it at about $136 million so far. It has the inside track for the number-one spot for a second straight week, but let's not forget that Godzilla spent two weeks at the top, too.